With its temperate climate and 300m of coastline it’s no surprise that Cornwall is one of the most popular dog friendly holiday destinations. It boasts numerous varied tourist attractions from Bodmin moor to the beautiful fishing villages. There are beautful vistas around every corner when you travel along the coastal paths and roads, and the number of cornish tea shops and ice cream parlours is plentiful so you won't go hungry. There are many stunning beaches and dramatic coastlines in Cornwall to explore providing a huge number of walks for you and your dog to enjoy. You then have the added enjoyment of refuelling with a famous tasty Cornish Pasty and a local ale. 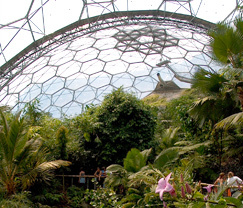 Because of its southerly positioning and mild climate it benefits from many stunning gardens such as the Lost Gardens of Heligan and the Eden Project to name but a few. One of our favourite spots in Cornwall is the dog friendly Watergate Bay where you can enjoy a walk along the beach and then afterwards treat yourself to a visit to Jamie Oliver’s Fifteen restaurant. We also enjoy walking around the headland at St Ives and afterwards coming into town and ambling around the quaint streets and independent shops and galleries. It’s not unusual to see seals appear along the Cornish coastline and in harbours as the fishing boats come in. Luckily if the seals get into difficulty there is the Seal Rescue Centre at Gweek to look after them. You can visit the centre and have the chance to get up close and see the seals and other rescued animals.